In the end, Russell designed a new house and attached it to the side of the church. His practise, James Russell Architects is run from a pigeon hole at the base of the new family home. 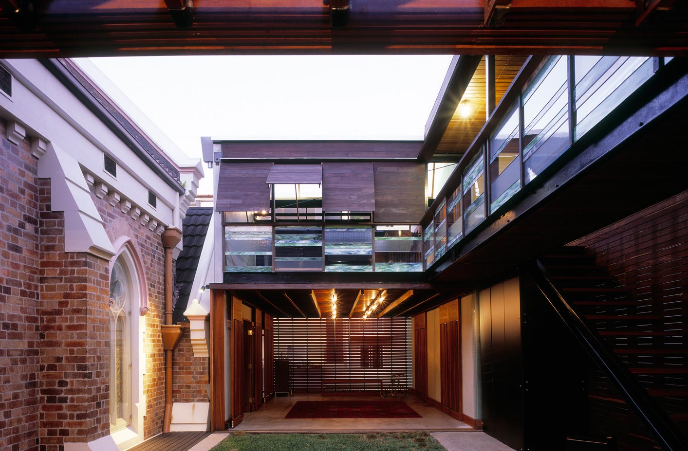 The church is now leased for commercial space and he leases his old office – a transparent glass pavilion in front of the church – to another architectural firm. There is a landscaped public square at the front of the cluster of buildings creating what has been described as a “village precinct’. 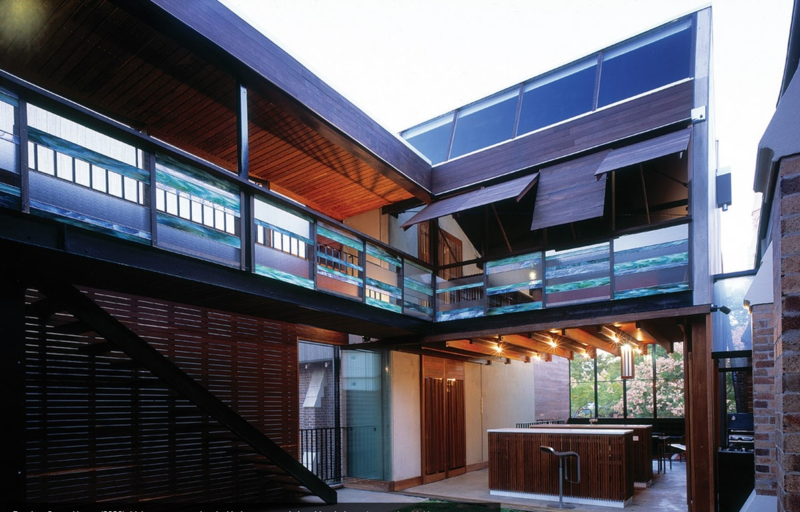 A major challenge in constructing the project was to create a family home within the chaos of two major arterial roads that feed the city of Brisbane. 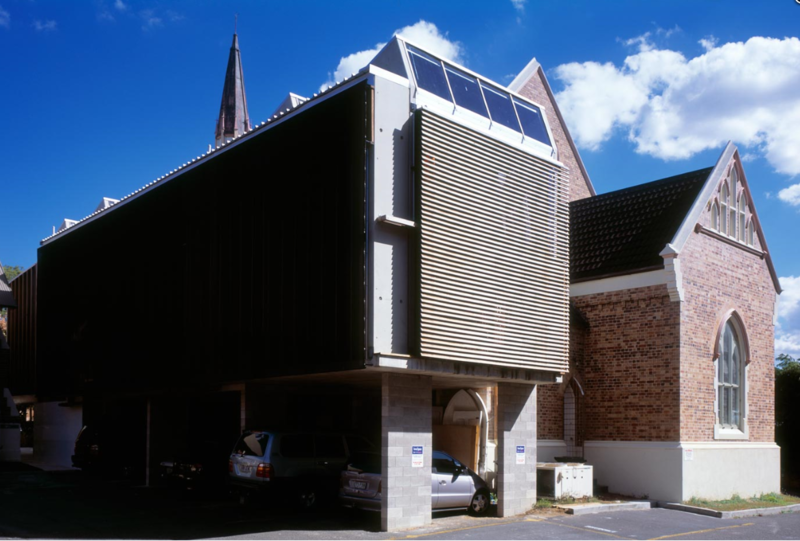 The narrow site was initially a car-park, wedged between the listed buildings and has a width of only 5.6m. According to Russell, his idea “was to create a sanctuary in this busy, built up area without feeling trapped. We have buildings on three sides and our main outlook is across the street to the heritage listed site of another church and an old school.” He explains how “at night when all the traffic’s died down, it feels like an old-fashioned street”. The addition is a concrete, steel and glass modernist box. These raw industrial materials contrast and enhance with refined timber joinery Russell has selected for the interior. Set back 16m and partially covered by a large rain tree, the box is almost invisible from the street. The entrance to the family home is a discreet timber door. A narrow internal stair leads to the kitchen and to the edge of a raised grassed courtyard. The house can completely open up to the courtyard, but they also have the ability to close it all off with large glass sliders and louvered screens. The layout of the house consists of two pavilions across the courtyard. The courtyard is the heart of the house and the draw for light and ventilation. From the first of the two pavilions, there is a relationship with the street to the south west and courtyard to the north east. This pavilion houses the living/kitchen space at courtyard level together with a mezzanine bed above. Across the court is the children’s playroom rolling onto the court and two bedrooms above. Upstairs the pavilions are linked by a bridge running along the edge. The rooms and the bridge act as a viewing platform. The brick church wall is the fourth wall so you are able to touch it and peer into the decorative pointed-arched stained windows. 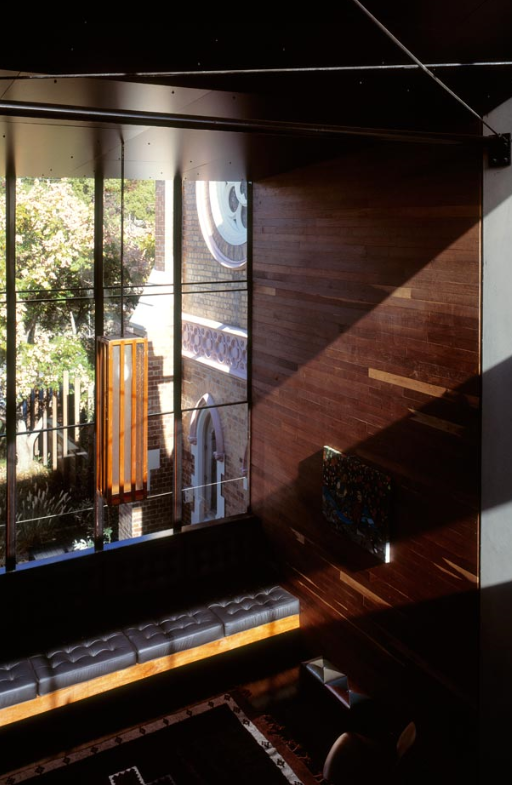 Timber Pivot windows regulate shade, light and rain. Bathrooms sit in partly exposed awning spaces and cooking is also routinely done alfresco under a glass roof wedged between the kitchen and church windows. Russell talks of the importance of the experience of light, sky, rain and earth in each of his works and draws on his fond memories of camping and sailing. In the architect’s words ” As on a boat, the inhabitant is required to be an active participant, adjusting openings to suit changing weather and seasons.”. Russell received a number of awards from the AIA in recognition of this sympathetic design. Whilst high density development was permitted under the planning scheme, Russell quite rightly decided that it was more appropriate to keep the development on a small-scale, enhancing the overall experience of the listed buildings.